Founded in 1848 the Pre-Raphaelite Brotherhood originally consisted of seven members: Dante Gabriel Rossetti (1828-1882) his brother, art critic William Michael Rossetti (1829-1919) painter James Collinson (1825-81) painter William Holman Hunt (1827-1910) painter John Everett Millais (1829-96) sculptor Thomas Woolner (1825-92) and art critic Frederic George Stephens (1828-1907). Dante Rossetti was a pupil of Ford Madox Brown (1821-93) who was also involved with the movement. Edward Burne-Jones (1833-1898) was one of Rossetti’s pupils and is included in the Pre-Raphaelite group. Born London 1828, the eldest son of Gabriel Rossetti, professor of Italian at King’s College, London and Frances Polidori. Attended King’s College School from 1836. Moved to Henry Sass’s Drawing Academy in 1841 and became a probationer at the Royal Academy in 1844. In 1848 studied under Ford Madox Brown and introduced himself to Holman Hunt after seeing his works at the RA Summer Exhibition. September that year the Brotherhood was formed. Met Elizabeth Siddal 1850. Met Edward Burne-Jones and William Morris 1856 and the following year worked with them on the Oxford Union Murals. 1860 married Elizabeth Siddal but she died two years later and Rossetti’s poetry manuscripts were buried with her. However, they were later recovered from the grave in 1869. At the same time Rossetti began his relationship with Jane Morris. A year later started taking medication for insomnia, which led to addiction. Between 1871-74 shared Kelmscott Manor with the Morrises. Died 1882. 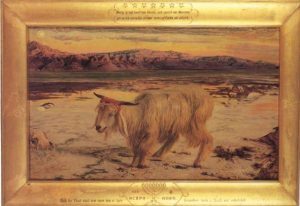 The Scapegoat 1854. Represents the Jewish ritual where a goat is driven into the wilderness on the Day of Atonement to carry away the sins of the congregation. 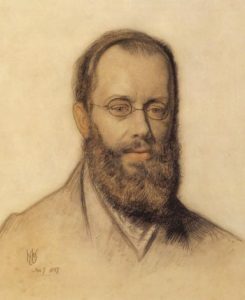 Edward Lear 1857. One of two portraits donated to Liverpool city and now in the Walker Art Gallery. parts of Europe with Rossetti. Exhibited at Royal Academy 1850. Toured Holy Land 1854-5 where he found inspiration for several worked including the Scapegoat. 1865 married Fanny Waugh but she died in childbirth within a year. 1869-72 made several visits to Europe, Egypt and Jerusalem. 1873 married his sister-in-law Edith Waugh. By the late 1890s his eyesight was failing. 1907 exhibited 125 works at Liverpool and donated two to the city’s art collection. Died 1910. Born 1829 in Southampton, youngest son of John William Millais and Emily Hodgkinson, the family moved back to Jersey, where Millais’s parents were both born, in 1833. He moved to London in 1838 to study at Henry Sass’s Drawing Academy and then moved to the Royal Academy as a probationer in 1840. Exhibited at the RA in 1846. 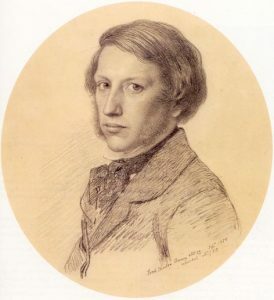 1848 began close friendship with Holman Hunt and became Brotherhood founder member later that year. Married Ruskin’s ex-wife Euphemia Gray 1855. 1870s began work on a series of portraits and in 1878 was awarded the Medaille d’Honneur after a very successful exhibition in Paris. Bubbles used 1886 by Pears Soap to advertise the product in magazines. Created Baronet 1885. 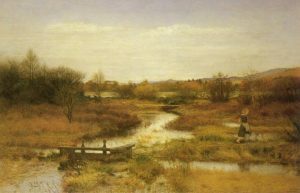 1890s returned to landscapes, including Lingering Autumn. 1896 elected President of the Royal Academy but was already seriously ill and died in August that year. 1898 posthumous exhibition at the RA. Born in Birmingham in a house on Bennett’s Hill. 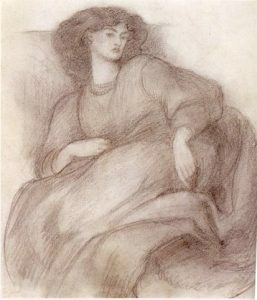 Burne-Jones studied under Ruskin and carried out many sketches of the works of the great masters, an influence that can be detected in his later work. For part of his career Burne-Jones designed for William Morris. 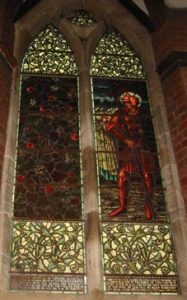 Fine examples of his art can be seen in St Philip’s Cathedral, Birmingham, which stands just a few hundred yards from where he was born. The building boasts four huge stained glass windows designed and installed between 1885 and 1897. Another church where Burne-Jones’s work can be seen is Wilden, near Stourport in Worcester. The tiny church there has several of his designs, although they were all installed after his death. The windows were all of a modular design and it was possible to order saints and holy figures, backgrounds and surrounds in a kind of mix-and-match way. The figures found at Wilden can also be seen in other churches in different combinations. 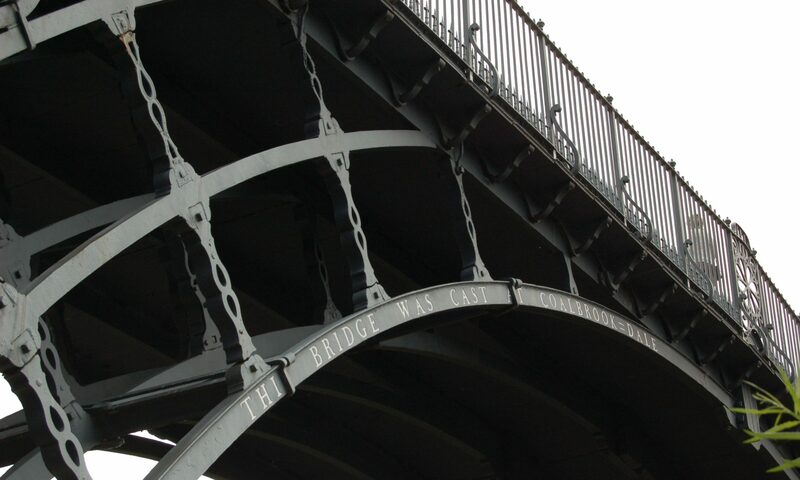 In the picture above, from Wilden, there are two panels. The left-hand one is a foliage design by William Morris but the right-hand one is Burne-Jones’s Joshua. In the background of the panel it is possible to make out trumpeters (from the bible story of the Walls of Jericho) It was possible to order other panels to stand beside this one that showed more trumpeters.